Hardly a day goes by that I don't think about Alfred Hitchcock. I dream of meeting him, but I fear that if that were to happen in an alternate universe (or heaven, I suppose), it might be a rather awkward encounter. I might even feel a bit intimidated. 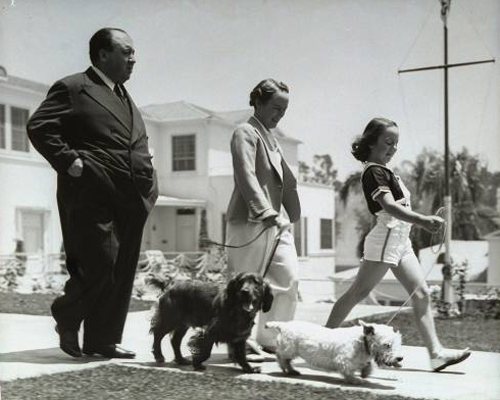 And so, in my dream, I meet someone else first: Hitchcock's wife, Alma Reville. If she liked you, Alma could be relied upon to grease the wheels of friendship between her guest and the great director. Plus, I hear that she made a mean Beef Beaujolais, so if the meeting was a flop I imagine I'd still have had a wonderful dinner. 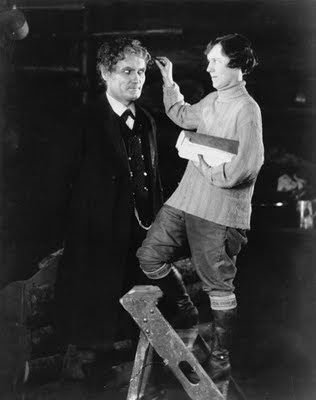 Handling continuity for The Mountain Eagle (1927), 5' 0" Alma ascends a stepladder to adjust Bernard Goetzke's hair. To those who knew her, however, she was content to be Alma, a gracious host and a thoughtful friend. She was a superb cook whose souffles were like her friendship itself: they never failed and always rose to the occasion. If her hand in the Hitchcock touch has been overlooked, it's mainly due to her modesty, which seems to have sprung from deep place of ego-security. She simply had no need for that kind of attention. By contrast, Hitch seems to have harbored a great deal of insecurity and fear. Yet, his public never really knew about that. For that we can also thank Alma, who was his staunchest defender and supporter and the only person to whom he revealed his vulnerable side. Because his films deal with the dark matter that resides in human nature, critics and fans alike have long assumed that Hitch himself was a bit “mogo on the gogo”—an armchair diagnosis that shows up Spellbound (1945). If you want an idea of what Alma's view of him might have been like, pop in a DVD of that movie. Gregory Peck plays “J.B.,” a man stripped of his identity and accused of being a homicidal maniac. As her name aptly implies, Constance Peterson (Ingrid Bergman) refuses to succumb to such thinking, even when the learned Dr. Brulov (Michael Chekov) pooh-poohs her defense of him, saying, “We are speaking of a schizophrenic, not a valentine.” She replies, “We are speaking of a man.” With those six words, she gathers up her interlocutor's collection of Freud's writing and hurls it back at him. I see that as Alma's rejoinder to hamfisted biographers who would conjure up demons in Hitch's psyche where there are none. “[There were] colorful hanging baskets of begonias everywhere. Only the English can do so well with their gardens and flowers—a built-in talent. Being so young at the time, I was a bit nervous, but once we got to the Hitchcock home, I felt at ease and we spent a couple of delightful days, eating (Alma cooked the meals and Hitch chose the appropriate wine) and relaxing. Alma was the perfect hostess because she was so simple and understated. Although she was opinionated and contributed a great deal to any conversation, Alma never talked about the past. And she never pushed herself forward. The only ego she displayed was in her presence—she was really there, she did not disappear. Alfred Hitchcock cut a large figure in more ways than one. Yet, Alma lived in no one's shadow. She was and always will be Alma Reville. With begonias and Champagne, Happy Birthday, Alma. She was a wonderful woman and so are you! A lovely post, and I will surely follow up on your reading recommendation. For a bit of fun, have you read George Baxt's "The Alfred Hitchcock Murder Case"? Young filmmakers Hitch and Alma are fictionalized as amateur detectives in a fun and respectful outing. Baxt did a series of such movies with classic stars and I love 'em. This was a seriously wonderful post! 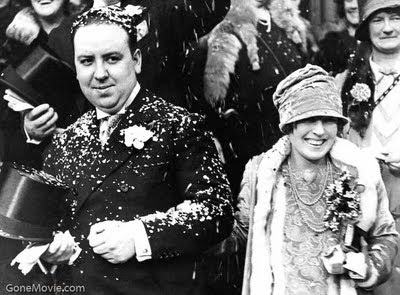 I live in constant adoration for Sir Alfred and I've always thought that Alma was just the coolest thing ever. I'm definitely going to check out that book! When one looks at so many of the great genius filmmakers, one often sees crazy and tragic lives. Not so with Mr. Hitchcock. I'm sure Alma had a huge part in that. I just love her! And Pat too. A couple years ago I sent her a completely dorky fan letter (I must have been 14 at the time). And she graciously responded with a simple, handwritten note. It was so exciting! Anyway, if this rambling comment has any purpose, it's to say that this post is awesome and I'm so glad you wrote it! Hi Caftan - Nope, I haven't heard of that book. Though I like the idea of putting Hitch in fictional situations - since it was something he liked to do himself! Joel--Moving, personal--a tribute I know Hitch would have been proud to read. Some artists remain outside of us, distant, elusive. Hitch and Alma have not. They find their place inside our psyche, and like family, remain comfortably there forever. What a wonderful post. It had me choked up by the end. Thank you for that. Great blog. I added a link to it. Thanks for that, I knew nothing of Alma, I assume therefore that Alma is who Helen Mirren will play to Anthony Hopkins Hitch in the movie 'Alfred Hitchcock and The Making of Psycho'.